Dogodek, na katerem bodo študentje iz šestih držav ob podpori domačih in tujih mentorjev sestavili prvo orodjarno za inovacije, gosti Univerza v Novi Gorici, Akademija umetnosti, skupaj z Zavodom Kersnikova. Mentorski tim delavnice sestavljajo Prof. dr. Peter Purg (UNG, Novi mediji), umetniški vodja Galerije Kapelica Jurij Krpan (Kersnikova) ter priznani interdisciplinarni umetnici Robertina Šebjanič (http://robertina.net/) in Špela Petrič (www.spelapetric.org/), gostujoči predavanji na temo menedžmenta inovacij ter njihovih povezav z znanostjo bosta ponudila Simon Mokorel (Flapax/Arctur) ter Prof. dr. Mladen Franko (UNG, Fizika), delavnico pa bodo ob izbranih zunanjih ekspertih z Goriške spremljali tudi drugi predstavniki konzorcija MAST. Več informacij o programu delavnice in projektu na https://mastmodule.eu/the-mast-module/course-ungstudio/ , oziroma v priloženem letaku. 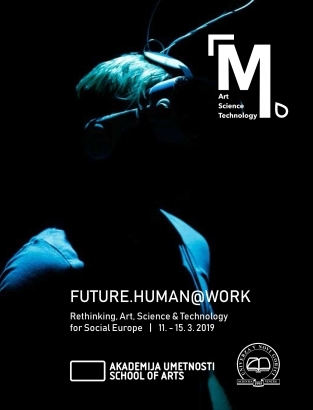 The second in this year’s cycle of MAST workshops will bring together artists, scientists and technologists from around Europe to learn from each other and develop methodologies that can bring about better futures for all. 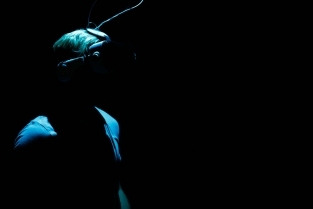 Based on a body of preparatory work, from March 11 to 15, 2019 the participants will meet at the University of Nova Gorica School of Arts to map, develop, iterate and pitch to the MAST committee novel methodologies that will gradually contribute to a toolbox for innovating the relationship of man and machine, in order to find innovative solutions for a truly Social Europe. As a long-term aim of MAST, bringing different disciplines together into such a general framework should open up not only new working places and styles, but also bring about a new profile — the “innovation catalyst”, a multi-skilled and cross-knowledgeable person that competently switches between different professional realms, interconnects and develops new paradigms, finds unconventional, art-thinking based solutions, as well as provides necessary translations among realms. Some creative concepts will be brought to Nova Gorica from the November workshop on Progressive Product Prototyping in Funchal, Portugal, several should spring up through new encounters and a fresh body of local participants in Nova Gorica, to be further iterated at the events in Graz (Spatial Design Challenge: Algorithmic Spatial Studies), Austria (April) then in Ljubljana, Slovenia (May), to be eventually evaluated, jointly reflected and prepared for the next academic year in the Rijeka, Croatia “Interfacing Academy” event.